Dark colored wooden stool with glossy patina. Seat is leaf-shaped and slightly scooped. Top is decorated with two incised lines down the center, and three sets of incised bands on each side. Front of seat terminates in a human head, which has a simian quality. Head has two round eyes and ears, a nose, and mouth that is slightly open. 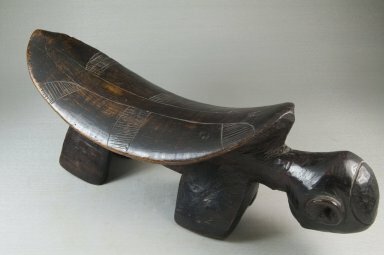 The stool has four legs with a centered handle connecting front and back for carrying. Condition: Very good. Signs of wear on edges of seat. A small area of edge is eroded.